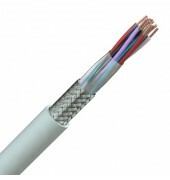 European alternative to the American style data cables, with cores twisted into pairs to reduce cross talk. The DIN 47100 colour code makes it easy to identify each conductor. The effects of electro magnetic interference (EMI) are also minimised by the use of an overall tinned copper wire braid screen. Used in signal & data transmission where flexibility is important LiYCY-TP is designed for fixed or occasional movement although the cable construction makes installation and routing through confined spaces simple. Plain copper wire conductors to IEC 60228 class 5, PVC insulation, cores twisted in pairs, overall tinned copper wire braid, PVC sheath – Grey. LiHCH-TP which is an LSZH version is also available.